On our drive from Chicago to our first nomadic “home”, Salt Lake City, I had a little bit of time to explore during our stay in Spearfish, South Dakota. 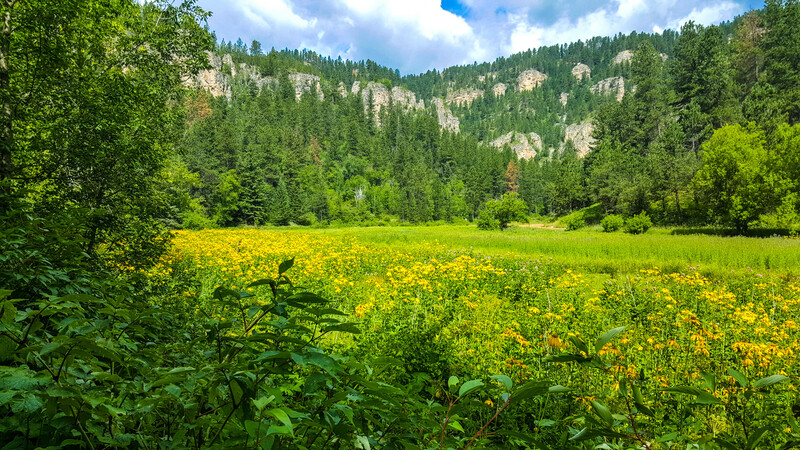 I only had a few hours, but the Black Hills/Spearfish Canyon area was so beautiful I couldn’t resist trying to get a hike in! I found the perfect trail: Roughlock Falls. Easy, flat, fast and incredible payoff for very little work. This trail had almost anything you could want in a short 2 miles. Meadows of wildflowers, 1000′ vertical limestone canyon walls, vibrant, thick cover for wildlife, birds and insects and a gorgeous waterfall. I walked this trail in street clothes (jeans and sneakers). No special equipment is needed for this hike, and while the trail is busy, it is plenty wide to easily move around slower hikers. If you’re ever in the Deadwood/Spearfish area, this trail is a can’t miss. Appropriate for all ages and abilities. Have you hiked in the Black Hills? Tell me about it in the comments!